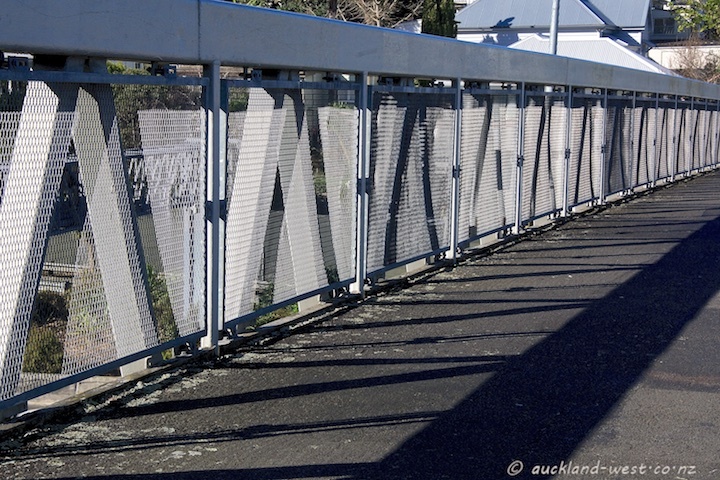 Footbridge across the motorway (SH16), connecting Grey Lynn and Eden Terrace. The connection from Dominion Road (in the distance) to New North Road (on the left in the trench) crosses Ian McKinnon Drive. 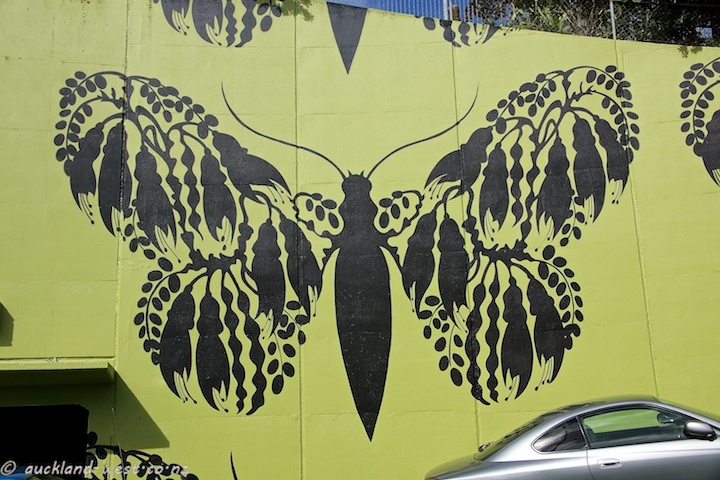 What used to be a bare expanse of a concrete retaining wall has been transformed into a cheerful scene of butterflies, constructed from elements of the kowhai tree: flowers, leaves and seedpods. Designed by Kate Millington, painted with Nigel Roberts. 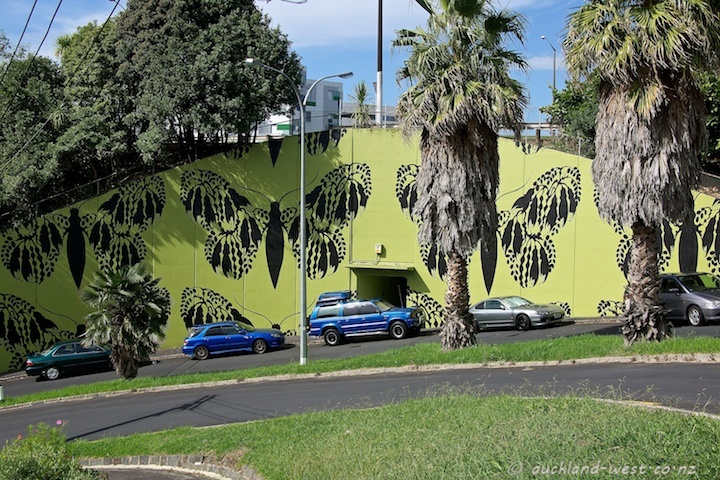 Credits also to Auckland Council and Albert-Eden Local Board, Ray White, Damerell Group, Dulux NZ, Kwanto Ltd, 3dm World, Wakefield Panel and Paint, Action Traffic. 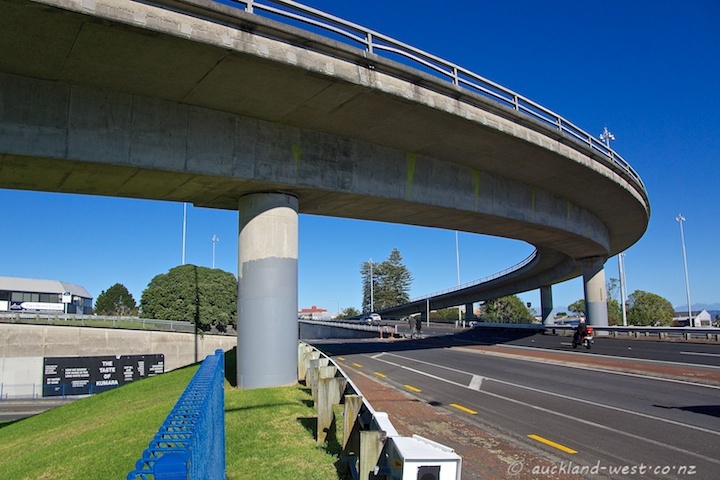 The end of Minnie Street, Eden Terrace, is defined by roads (Ian McKinnon Drive, New North Road connector) and the retaining walls which hold them up. Surrounded by green, Lot 23 stands by itself, one of its walls decorated with this large mural by Elliot Francis Stewart “Knucklebones”. 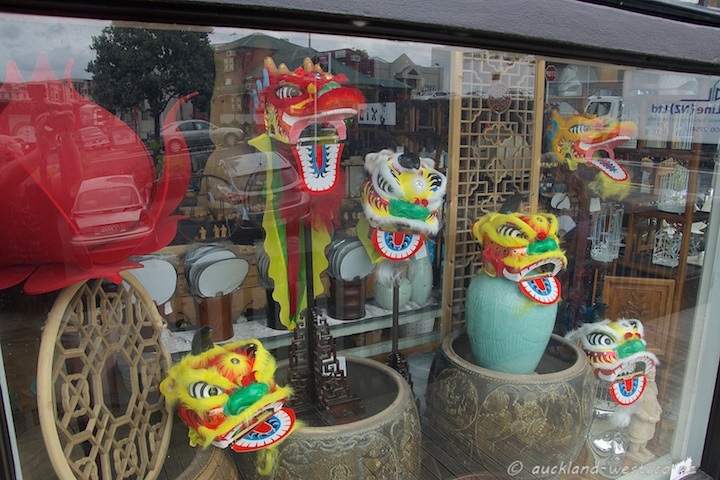 The Year of the Sheep has started, and the window display at Xia is in tune with the season. 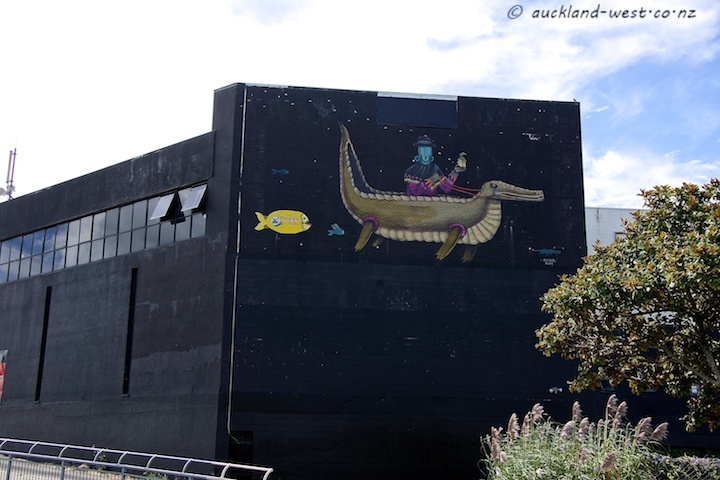 This huge mural brightens up one of the black walls of a warehouse (presently for sale) next to Ian McKinnon Drive in Eden Terrace. 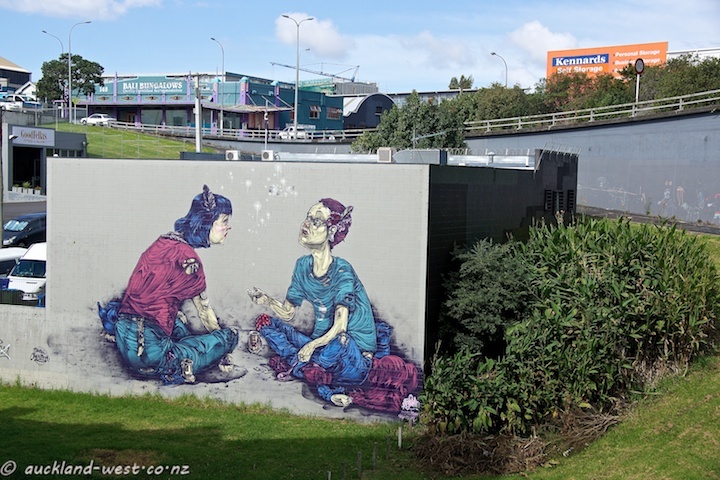 A prime position for a mural with optimal visibility. 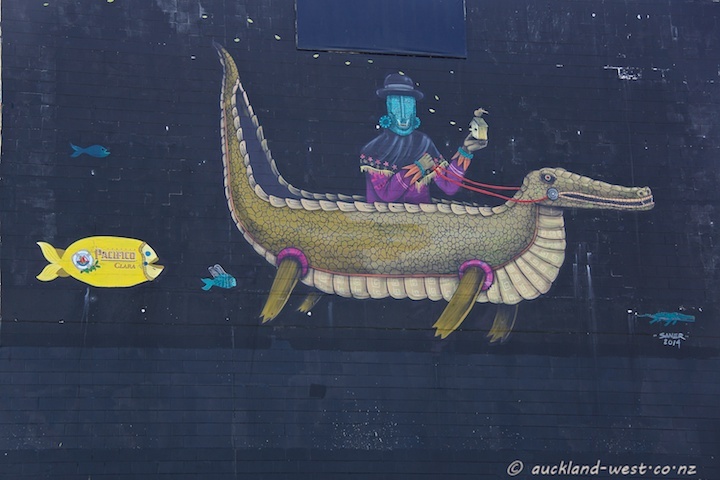 Manual Magazine has an interview with the Mexican artist (Edgar Saner Flores, ‘Saner‘) with a video of the creation of the piece. “I was invited by the Pacifico Beer company to create a mural with my vision and an exhibition, this as an activation and to create a different experience. This is a very attractive open space in Eden Terrace. The park in its present form was created about ten years ago, designed by landscape architect Ted Smyth. 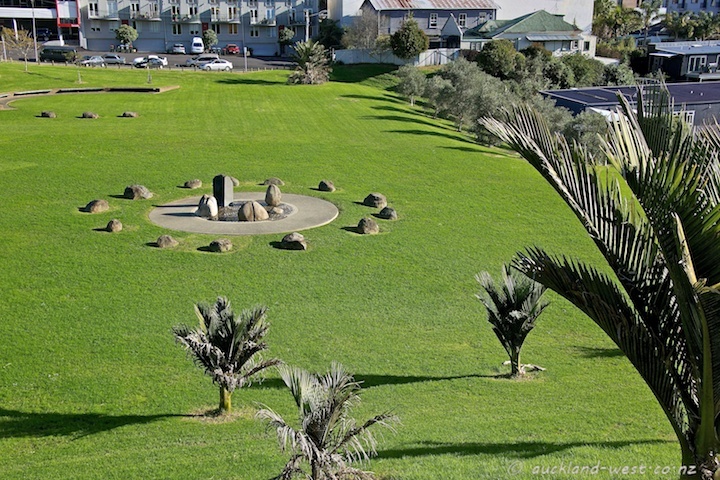 Plantings of nikau palms and circular arrangements of stone make for visual interest. 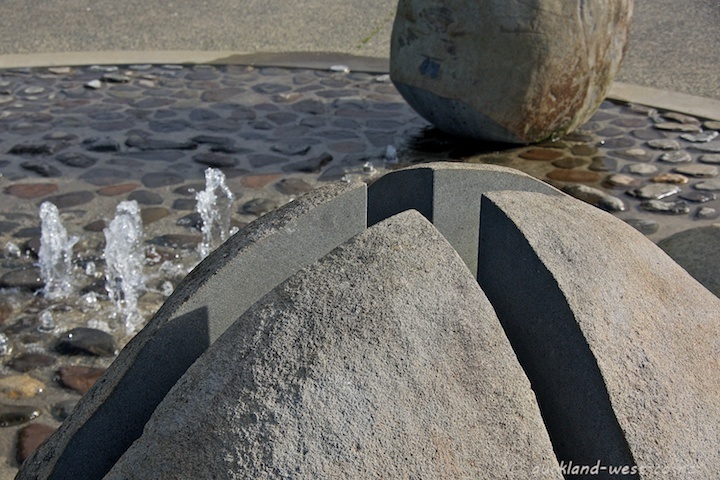 The five rocks incorporated in the water feature symbolise the five stars of the constellation of the Southern Cross.